1) Why does Survival want the Bushmen to live in the past? We don’t. Our campaign has nothing whatsoever to do with living either ‘in the past’ or in a ‘modern’ way. It has simply to do with the rightful demand of the Bushmen to live on their ancestral land and to be treated with respect. 2) But the CKGR is a game reserve – surely people can’t live there? Why not? They have done for centuries. What harm have they done? People live – legally and without problems – in conservation zones all over the world. 3) But when the CKGR was established, the Bushmen did not have livestock – surely the situation is different now. It isn’t very different. The Bushmen have tiny herds of goats and some small fields, which were introduced by the government itself decades ago. They’ve had a handful of horses for over a generation. The Bushmen do not harm the environment at all. In fact, they help it: they know far more about the wildlife than the park guards. 4) But the government says the Bushmen’s herds were diseased and were affecting the game animals. That is not true. Amongst other excuses, this claim was used to try to justify the government’s refusal to allow people back into the reserve following evictions. Before the relocation, the government had made no attempt to assess the supposedly adverse effect of the Bushmen on the wildlife. 5) But the government says the Bushmen were hunting with guns from vehicles. That’s not true either. The park guards themselves have repeatedly denied it, so has the ex-director of the wildlife department, under oath. Where are the Bushmen supposed to have got the ammunition for their non-existent ‘high-powered rifles’ and the money to pay for it? 6) But isn’t it the government’s duty to make sure the Bushmen have access to a clinic? The Bushmen inside the CKGR had a mobile clinic before the government shut it. Bushmen inside the CKGR are no further from the new clinic (at New Xade) than many remote communities throughout Botswana are from their nearest clinic. Anyway, if Bushmen want to be nearer the clinic, they can choose to go and live in New Xade. Why force them? The other two relocation camps (Kaudwane and Xere) do not even have clinics, just tiny health posts. 7) Isn’t it the government’s duty to provide schooling and wasn’t this too expensive inside the reserve? There was a school inside the reserve until the government shut it. Even then, it was far cheaper to transport children between school and their communities than it was to pay for the relocations. 8) Wasn’t the provision of water services inside the reserve too expensive for the government? No, the cost of providing water to the relocation camps outside the reserve is far more expensive. If it was a matter of cost, the government would have done what others have now done: sink new boreholes, so it’s no longer necessary to send a truck to the reserve. In fact, the European Union offered to pay anyway (the government refused). It cost nothing at all for one community inside the CKGR to get water from its own borehole. The new relocation camp of New Xade outside the reserve, on the other hand, had no water at all and needed an extremely expensive pipeline to bring water to it (actually coming from inside the reserve!). 9) Why does Survival want the Bushmen to return to the CKGR? We don’t want all Bushmen to return to the CKGR. We want the right of those who want to return to be respected. The number will probably be less than 1,000. Why won’t the government let them go back? 10) Why does Survival want the Bushmen to be cut off from the rest of society? 11) Isn’t ‘living with the animals’ very backward? Why should it have a place in modern Botswana? Most people in Botswana ‘live with’ animals, in most cases, with herds of cows and goats. How is this more ‘modern’ than hunting? It’s actually not much different. Thinking it’s ‘inferior’ is just prejudice. 12) Don’t the Bushmen live in a very primitive way inside the reserve? No, they are intelligent human beings. They live and eat well. They use their surroundings as if they were their supermarket. Other Botswana citizens use their herds in the same way, or use their skills to earn money to buy food. The Bushmen use their skills to get the food without needing money to buy it. There is nothing ‘primitive’ about it at all. They deserve respect for their way of life, the same as everyone else. 13) Surely some peoples are more advanced than others? This is an old European idea used to justify colonialism and fascism. It is what European racists used to say about Africans. It has no basis in science. (And even if some peoples were ‘inferior’ or ‘backward’ it still would not justify violating their rights.) Certainly, some societies are weaker than others, but that is a different thing. 14) Does Survival believe in ‘progress’? Yes, we believe that the fundamental basis of all human ‘progress’ is respect for other people, particularly those who are weaker. It is easy for governments to respect the majority and the strong because they have to! 15) But only a tiny minority of Bushmen throughout Botswana want to live inside the reserve. Then why not let them? About 650 Bushmen were forced out in 2002 and, in spite of government harassment, about 250 returned until they were evicted again in 2005. The great majority of these people have all expressed their wish to be allowed to return. 16) Isn’t it just the old people who want to live inside the reserve? Not at all – many young people also want to live on their ancestral lands inside the CKGR. 17) Why is Survival trying to hurt Botswana’s economy? We aren’t. What possible advantage can it be to anyone to hurt Botswana? On the contrary, we are trying to help the most disadvantaged sector of the Botswana population. 18) Why then is Survival calling for boycotts? Boycotts are one of the few tools that ordinary people have to express their views about what governments and companies are doing around the world. They don’t harm the economy, but they do damage the reputation of governments. South African goods were boycotted for years during apartheid rule. 19) But if boycotts do damage Botswana’s economy wouldn’t it be Survival’s fault? No, it would be the government’s fault. The boycotts could end tomorrow if the Bushmen were treated fairly. No government today should be allowed to oppress its minorities. The solution to the problem is with the government, not with Survival. It can end the boycott tomorrow by upholding its own High Court’s ruling and letting the Bushmen live freely on their land without having to apply for permits to enter their own home. 20) Isn’t Survival singling out a poor African state? What about problems closer to ‘home’, such as the European Roma people? are generally well organised themselves and have never asked for help. 21) Isn’t Survival a newcomer on the scene? No, Survival has supported the Bushmen since the 1970s, when we secured funds for Botswana government projects with them. We first met with government representatives about their plans for the CKGR in the early 1980s. 22) Why doesn’t Survival leave it up to Botswana NGOs such as Ditshwanelo? Because experience shows that they are far too close to government to have any teeth or properly represent Bushmen interests. 23) In southern Africa we do things by talking as friends, not criticizing. That’s not always so. International and local opposition to draining parts of the Okavango succeeded in halting this ill-judged government scheme in the 1990s. There are countless examples of how international criticism has changed government policies all over the world, including in Africa. Opposing human rights abuses is the business of all of us. 24) Wasn’t the government negotiating with the Bushmen at one stage? No, the government has repeatedly refused to ‘negotiate’ with the Bushmen, insisting instead on ‘consultations’ and never with the intention of coming to an agreement with the Bushmen, or even of listening to them. It has simply told them it wants them off their ancestral land. The government’s definition of ‘consultation’ is just to present its own decisions. 25) Isn’t the government a free and democratic one? Critics of the government are separated from their families and expelled; Ministers have said that I should be arrested; officials have told me that I would be beaten up; the Bushman’s lawyer has been barred from Botswana. These are not signposts to freedom and democracy. 26) Hasn’t Survival lied about incidents such as Bushmen being shot or tortured? No. All of Survival’s information is true. Beatings and torture have been going on for years and are still occurring. This has been well documented although nothing has been done about it. There were three separate shooting incidents in September 2005 when CKGR Bushmen, including a child, were wounded by police. 27) Isn’t this all to do with you, personally, Stephen Corry? Not at all. Government people have said they’ll just have to wait for me to die. In fact, my death will make no difference to anything. Survival is the world’s foremost tribal peoples’ support movement and it is united behind this campaign. It does not depend on me or on any individual. Hundreds of thousands of people are behind this cause. 28) Then isn’t it all just to do with Roy Sesana? No. The Bushmen don’t do what Roy Sesana tells them: he is one of their spokespeople. We have listened to every single Bushman – there are hundreds of them – who wants to go home to the CKGR. 29) Why is Survival opposed to talks with the government? 30) Why does Survival say that all this is really about diamond mining in the CKGR? Because it is: Although the government, De Beers and Botswana NGOs still pretend it was nothing to do with the evictions, mining is now taking place on Bushman land. However, many people simply won’t buy the gems when they know what happened to the Bushmen. 31) But could mining go ahead even if the Bushmen’s rights to their lands were respected? 32) Then why doesn’t the government simply allow those Bushmen who want to return to the CKGR to do so? It wants them out now because it’s afraid their presence might complicate mining in years to come. It hates the idea that the Bushmen are not inferior, can make up their own minds, and that they have rights. Officials have told them, ‘We will own you until the end of time.’ The government clings to this backward master-servant, essentially colonialist and racist, relationship. 33) Is Survival challenging the power of the Botswana government? Not at all. We have always known that only the Botswana government has the power to resolve this matter. 34) Isn’t this all about the old colonial power, Britain, telling Botswana what to do? Not at all. The British government won’t help the Bushmen either. Survival is critical of many governments because of the way they treat their indigenous people. We are also critical of the British government. 35) On what basis does Survival argue that Botswana should respect the wishes of the Bushmen and allow them to live on their ancestral land? Because of international law and fundamental human rights. The land rights of indigenous and tribal peoples have been recognized in international law for 50 years. Botswana ignores this and refuses to sign the international convention. 36) What gives Survival the right to speak for the Bushmen? We have never claimed to speak for anyone. The Bushmen are perfectly capable of speaking for themselves. We stand up for those who have suffered violations of their rights, and we amplify their own voices in a way they, themselves, can’t. That is our job, just as it is for any human rights organisation. For years, the CKGR Bushmen have repeatedly asked us to help them. 37) What will Survival do if the court finds that the Bushmen should not be allowed to return to live and hunt in the CKGR; or if the court rules for the Bushmen but the government ignores it? We will carry on the campaign. 38) What will Survival do if the government tells the Bushmen that those who want to can return to the CKGR and live and hunt and gather there without harassment? We will welcome the decision and halt the campaign. Botswana might then really become a ‘shining light’ for indigenous peoples’ rights in Africa. 39) If the government won’t agree to that, are there other things which would make Survival halt the campaign? No. Our job is not to bargain away the future rights and welfare of the Bushmen. We have shown our ‘staying power’ for decades now; we simply won’t give up. That’s not a threat: it is simply a statement of fact. 40) Why do you call them ‘Bushmen’? Survival uses the term Bushman for two reasons. 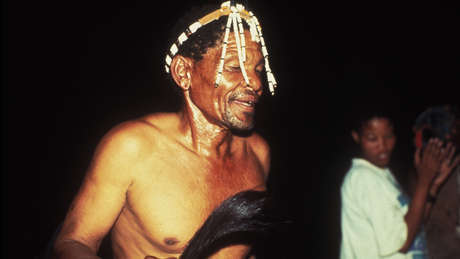 Firstly, when Survival has asked Bushmen what they think themselves, they generally reply that, if speaking English, they prefer ‘Bushman’ to Basarwa or San. Secondly, it is the most readily understood by readers of English, an essential consideration in spreading information about their fight for survival. This second reason is perhaps why Botswana’s own Tourism Board uses the term.